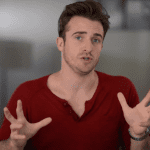 Get The Guy / Matthew Hussey's Dating Advice Blog / How Can I Get Kissed Under The Mistletoe? I’m back in New York right now. It’s snowing here and feeling very Christmassy! It’s tough, especially when someone’s family means more to them than they do to you. Unfortunately, Christmas is also about family, so trying to exclude them on that one day is not easy. 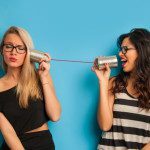 I think you have to communicate that you want your special time together with your husband; a time where you have your traditions, quirks and moments, but that you also want to make him happy by spending time with his family. Embrace them make it a great day. I have a 7 Step Guide for this. If you want to go through the entire guide – designed to get you that kiss on New Year’s Eve – it’s available here. To get all 7 Steps, head on over to KissHimAtMidnight.com for the full guide. 4 Responses to How Can I Get Kissed Under The Mistletoe? Matthew, your faces while you’re listening to the advice from that lady are so funny to watch! Shame Matt… Elle seriously has the worst columnist in the entire world. They don’t do themselves any favours by having her there. Don’t worry… you always, bar never, come across a million times better and no one associates the two of you at the same level whatsoever. I know it’s not that great for you (less fun) when she’s there but in a way, it elevates you that little more. Still love watching you and I’ve learned SO MUCH from you! I take your advice and it’s going REALLY WELL over here. Thank you! The woman with glasses next to you makes me nervious. I honestly can´t undestand what is she doing in the program. thank you hero for all your videos . how are you doing hero , because i think you need to get some rest and to take care of yourself ( I’m not giving any advice but I’m sharing what do I feel ). I’m reading your guide , and let me tell you this in you Menglish . you are BRAINAL . to be honest I don’t have time these weeks , cuz I have exams .as you know I have to have time for the person who I’ll relate with .